Note: If you are completely unfamiliar with Ashtanga this article might sound strange. Read on for a primer in Ashtanga yoga styles. The point of this article is to emphasize and explain the importance of guided ashtanga classes. Lately, I’ve observed that most of the Mysore style students do not attend the Friday morning guided classes. There are two ways Ashtanga yoga classes are taught – guided being the most common, where a teacher talks and directs students into poses. Everyone moves together. The guided Astanga teaching method resembles the method of other styles. Distinct from a typical yoga class, in Mysore style students practice at their own pace. Everyone in the room could be doing a different pose at any given moment. Ashtanga Mysore is scary for many people, yet offers many unique benefits including the ability to work at your own place, practicing in peace, getting extensive one-on-one interaction with the teacher, and developing independence in yoga. All indisputably great things. Usually as a teacher I have to convince students of the merits of Mysore method of practice, and coax them into trying it out. I started learning Ashtanga in a guided introduction class, similar to our own “Intro to Yoga” Class. I was introduced to the Ashtanga series in a set of eight weekly classes. After this introduction, I moved on to guided classes for several months. Once I lmade the leap from guided classes to Mysore style I was hooked. I realized that I could practice independantly, a very important aspect of Mysore style. At the time I was a corporate executive, and often traveled to places without yoga on offer. 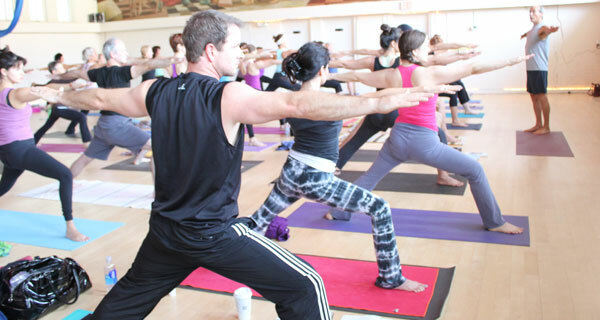 A preference for Mysore style seems to develop in many dedicated ashtangis. Then somewhere down the line students get so comfortable working at their own pace they stop coming to the guided classes. At times I have struggled with resistance to guided classes: feeling like a robot, monotony, too many jump backs, too slow or too fast…….While studying in Mysore India these resistances would surface, and I toyed with the idea of skipping the Friday guided class. I was not alone. Many of the more advanced students, those working on second and third series would be absent from the one guided primary series class on Friday. Sunday’s practice is guided primary or Guided Second series for those who are split and work only on second. We would never miss the guided second series, but were happy to skip Fridays class. Sharath and Guruji (Sri Pattabhi Jois) would notice and used to tell us we couldn’t skip this class. Over time I’ve come to see the merits and importance of weekly guided classes. Community. This class builds a very unique subtle community mew are not talking, but we are moving and breathing in unison. This doesn’t happen often in life. We get to move and breathe with a group of like-minded souls. Here in New Orleans we go for coffee after yoga, in India it was chai. Breathing . We all get into patterns of shortening or lengthening our breathing or shortening. In this class you follow the vinyasa count. This might be faster or slower than your normal count, no matter; it is important to breathe rhythmically. Tradition. We love the tradition of ashtanga. The guided class brings us deeply into this tradition, connecting us with thousands of yogis around the world who practice the same way. In Mysore india, Friday we all attend guided primary series. Vinyasa. You will learn the correct vinyasa, how to inhale and exhale into and out of postures. You get to practice lots of mythical jump backs and jump throughs. Sanskrit. Students often ask me about learning posture names. This is the easiest way to learn the Sanskrit names of the postures. Knowing Sanskrit is important, because the Sanskrit sounds produce specific subtle vibrations that affect our bodies and minds. Surrender. This one day you have to follow the teachers count. Just one day. Most yogis follow along in each class. In Ashtanga it is expected once per week. Practice, abhyasa, is the heart and soul of yoga. I hope to see you on the mat. At Balance Yoga we are rotating teachers for the 7:30am Friday guided class. That way we can all attend and also practice with you. Upcoming rotations: 1/ 24/14 – Meredith; 1/31/14 – Jessica.